When many people think of chess, they think of adults quietly facing off across a chess board. What a lot of folks don’t realize is that chess isn’t only a game for adults; there are plenty of kids who are chess fans, as well. In fact, kids as young as kindergarten-age can learn and excel at chess. Unlike other games or sports, chess is an activity where age and physical size really don’t matter – all that counts is brainpower and problem-solving skills. This has created a huge market for kids’ chess sets. Chess sets for kids come in every theme imaginable, and they serve two purposes. First: they work well to attract the interest of a child who otherwise might not have a desire to take up chess. If your child isn’t interested in the movements of pawns and bishops, they’ll certainly be excited about helping Batman or Super Mario characters do battle against the baddies. 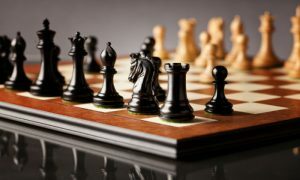 Kids’ chess sets are also a fun reward for budding chess players who would be thrilled to receive a themed chess set for a birthday, holiday, or as a congratulations for bringing home a chess championship win. We’ve scoured the world of kids’ chess boards and chess pieces to find the ones that are the coolest, most exciting, and (given that we are talking about kids, here) the most durable. Keep reading for our list of the Best Kids’ Chess Sets of 2019. 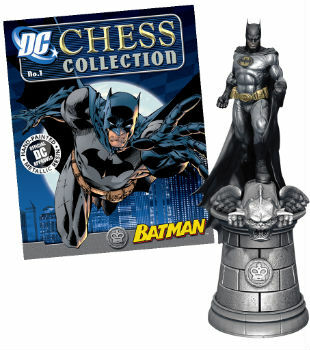 For superhero fans, it doesn’t get any better than a Batman chess set for kids. The Complete Batman Set from the DC Chess Collection is an officially-licensed Warner Brothers set, so this is a truly nice set that’s great for play or as a collector’s item. 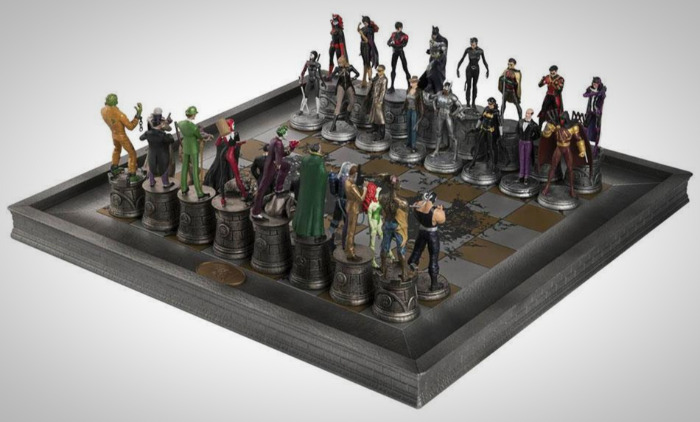 On one side, we have the Joker, Harley Quinn, the Riddler, the Penguin, and many other evil minions waiting to overtake Gotham – or at least the chess board. The other player gets to take on the part of the hero with Batman, Batgirl, Robin, Alfred, and others ready to fight for justice. 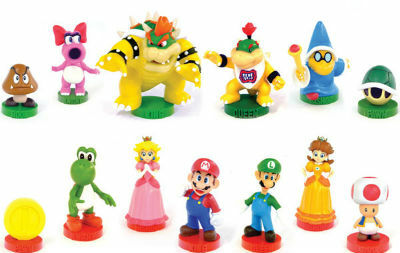 Each figure in this children chess set is hand-painted, and each one is a different character– even each of the pawns! Note: While we found this exciting, it also means that this is a better set for older kids who are more experienced at chess and can memorize which piece is which. 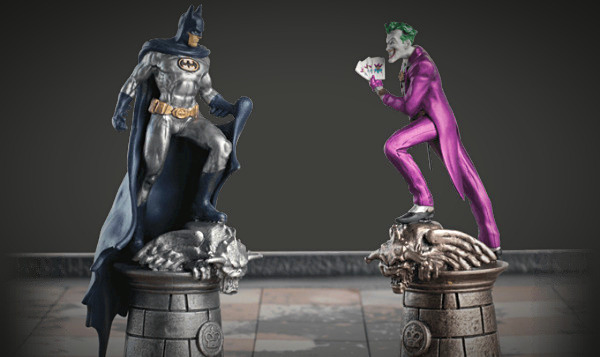 For those who aren’t familiar with who’s who in the world of Batman, you can tell one side from the other by checking out the bases of the characters; the light side has silver bases while the dark side figures all rest on bronze. 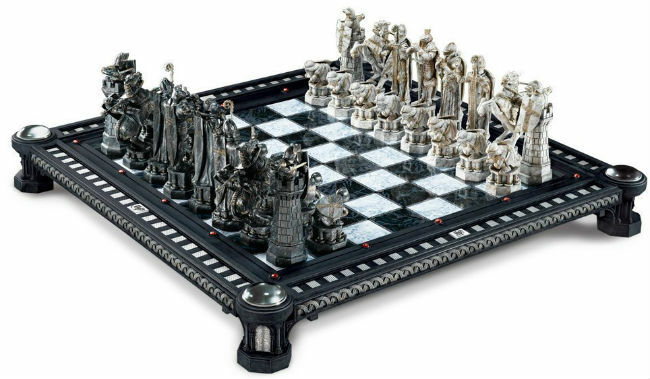 Even the chess board takes on a distinctive Batman theme; 20” x 20” in size, it has bats scattered across the board and converging in the center to create the Batman symbol. Is everyone who’s still here a Harry Potter fanatic – or at least shopping for a gift for one? If so, you’re going to love The Final Challenge Chess Set just as much as we do. 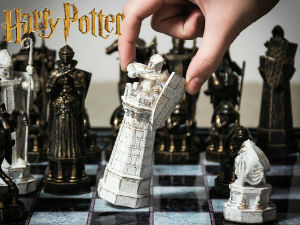 It’s a smaller version of the life-sized chess game that plays out in the final challenge of Harry Potter and the Sorcerer’s Stone. That’s right; we’ll repeat that: this is a Warner Brothers-licensed replica of the giant pieces that Harry, Ron, and Hermione did battle with in the first Harry Potter movie. (We love that scene so much, by the way, that we included it our list of the Best Chess Movies.) This is the perfect chess set for kids who are fans of the film. Crafted by the Noble Collection, this set comes with 32 pieces that measure from 2 1/2” in height to 5 1/2”. 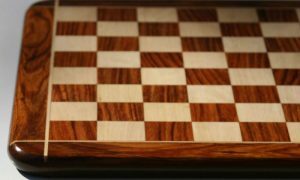 The elegant, arena-style raised chessboard measures 20” x 20”. If your child hasn’t gotten their Hogwarts letter and is going to have to settle for Muggle chess over wizard chess, this is a set they’ll adore. Can chess and sports go hand-in-hand? 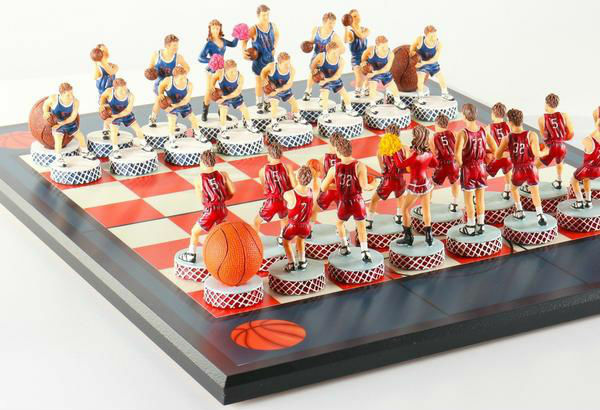 With this Basketball Chess Set, they certainly can. 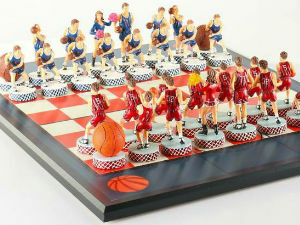 It’s the perfect chess set for kids who enjoy a good game on the chess board as much as they do on the basketball court. Here, you’ll find opposing basketball teams lined up and ready for action. The hand-painted polystone chessmen (and women; the queens are both cheerleaders) all have a very cool retro feel that calls to mind toy figurines of the 60s and 70s. The rooks are basketballs, which we found fun, and each figure sits atop a felt-bottomed base that resembles a portion of basketball net. The kings in this set measure 4” with a 1.5” diameter base. They’re pretty solid pieces that collectively weigh 3.4 lbs. The chessmen have a very cool retro feel that calls to mind toy figurines of the 60s and 70s. 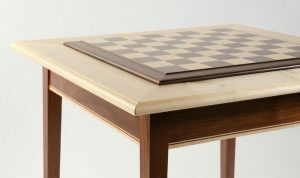 The board for this set isn’t just any kids’ chess board; in addition to the regular chess board layout, you’ll note that there are basketball court markings, as well as painted basketballs gracing each of the corners. 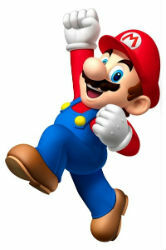 Cue the Super Mario Brothers theme song playing in your head. Is it stuck there for the rest of the day? Good! 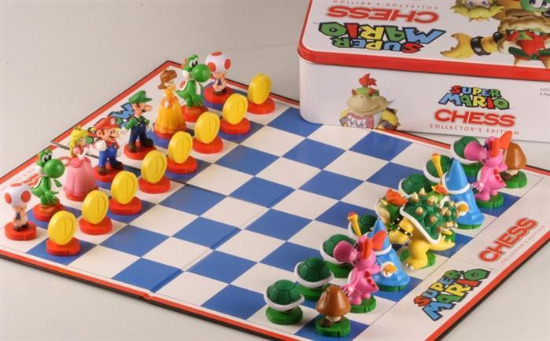 Because that’s the perfect earworm to have while you’re looking at this awesome Super Mario Brothers Chess Set – the ideal children chess set for video game lovers. 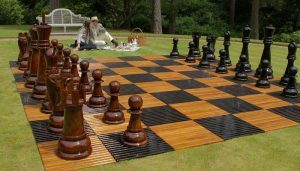 The figures are made of plastic and the folding chess board (18 3/4” x 15 1/4”) is constructed of cardboard. While this isn’t a super high-end set, it’s durable and there are no sharp edges, making it the perfect chess set for younger kids or those who are just starting to learn how to play. Everything stashes neatly away in the included collector’s tin, too, making it super-easy for your young player to keep all the pieces together. Especially if you’re a parent (or cool aunt or uncle) who’s hoping to get a child interested in chess for the first time, it can be tricky knowing which chess set to choose. While chess is an educational game that helps build brainpower and life skills such as critical thinking, sportsmanship, and diligence, you also want them to know they’re about to have fun. This is what makes chess sets for kids so great; they’re an effective way of teaching kids the game using equipment that’s appealing to younger players. 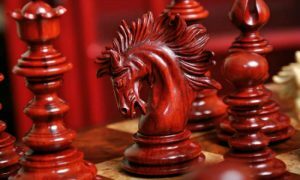 As you look through our reviews of the best chess sets, here are a few tips to keep in mind while you shop. While weighted chess pieces add heft and elegance to the game, they may be awkward for small children to move around the board. Due to this, choose a kids’ chess set with lighter pieces if you’re buying for a really young child. 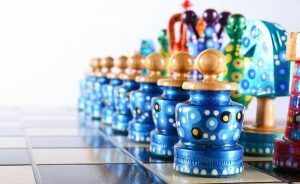 While some kids’ chess sets are more affordable and made of materials that aren’t easily damaged, others feature delicate chessmen that could be damaged if dropped and boards that can be more easily scuffed or scratched. Opt for a board that’s appropriate for your child’s age and maturity level. 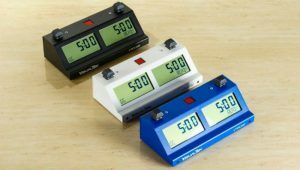 If they’re old enough to sit through a game or two of chess, they’re likely old enough to appreciate a nicer, more expensive set, but you don’t want to fork over a lot of cash on a kids’ chess set and find them flipping the pieces off of the kitchen counter or losing them under the bed. Still Looking for a Kids’ Chess Set? While these are some of our absolute favorite chess sets for kids, if you didn’t find what you were looking for here, don’t give up! 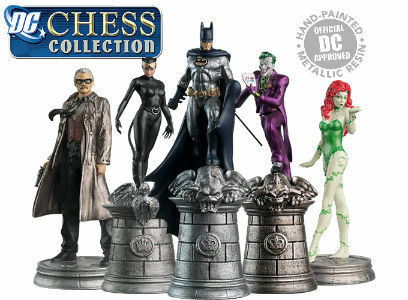 Head over to our page for The Best Themed Chess Sets and read through the selections there. From dragons and animals to superheroes and history, you’re sure to find a chess set for every interest imaginable.